Scientists at the Massachusetts Institute of Technology (MIT) have developed a way to charge lithium ion batteries in seconds, instead of hours, that could open the door to smaller, faster-charging batteries for cell phones and other devices. The breakthrough by Cedar and graduate student Byoungwoo Kang is the development of a reengineered surface material for batteries that allows lithium ions to move quickly across the surface of the battery and channels the ions into tunnels. A prototype battery built using this surface material can be charged in 20 seconds or less, compared to 6 minutes for a battery cell that does not use the material, MIT said. The surface material is not new but is manufactured in a different way. This means batteries that use the faster-charging surface material could be on the market within two to three years, the statement said. The prospect of electric cars that can be recharged within 10 to 15 minutes moved a step closer last week with the announcement of a new pilot project in Arizona. Car giant Nissan announced that it has signed a partnership with electric vehicle charging technology firm ECOtality and Pima Association of Governments, which represents the Tucson, Arizona region, that will see the three parties work together on rolling out a charging network. ECOtality said that it would aim to have parts of the public recharging infrastructure rolled out by 2010, in readiness for the US launch of Nissan's zero emission vehicle. Nissan added that under the agreement it would then make a supply of electric vehicles available to the regions public and private fleets. The Minit Charger fast-charge technology from ECOtality subsidiary eTec was developed in 1996, and 4300 stations are currently in use for fast charging forklift trucks. You can see a video of the Minit Charger in action here. Toshiba is to ramp up production of a new type of Lithium Ion battery that can charge to 90 percent of its capacity in a few minutes and is highly-resistant to short circuits. Toshiba will increase that to several tens of millions of cells per month at a new factory it plans to build in Kashiwazaki in Niigata prefecture in north west Japan, it said last week. Construction of the factory will begin in late 2009 and production is scheduled to begin a year later, said Hiroko Mochida, a Toshiba spokeswoman. At September's Ceatec show in Japan Toshiba demonstrated a laptop running on an SCIB. The battery will keep its performance through up to 6,000 recharges -- more than ten times that of typical Lithium Ion batteries -- meaning a laptop should be able to run its lifetime on the SCiB without need to replace the battery. Due to its design it is also much less likely to catch fire or short circuit if crushed or damaged. In September 2008 Schwinn Bicycles announced a strategic collaboration with Toshiba Corporation that they think is going to dramatically improve the uptake of electric bicycles around the world. Schwinn presented the results of this collaboration at the recent Interbike International Bicycle Expo in the form of the Tailwind. The Tailwind incorporates Toshiba’s new Super Charge ion Battery (SCiB) technology. The SCiB technology will enable Tailwind owners to recharge their battery in 30 minutes through a standard electrical outlet or as little as five to seven minutes through a commercial charger. By comparison, it takes four hours or longer to fully recharge the battery of most other electric bicycles. Battery recharging times remain a major obstacle for electric vehicles. But perhaps not for long. Proterra claims that its new all-electric buses can recharge in as little as ten minutes. 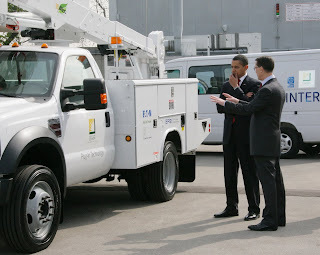 Last week the company demonstrated one of its buses in San Jose (see the video below). Seattle and San Francisco are also considering buying the Proterra's buses. More info on Proterra here. Last week, it was also announced that the Tesla will have 440V fast-charge capability, similar to the Minit Charger specs. Apparently Nissan's upcoming TBD all-electric car will also have the ability to fast charge in 26 minutes. It would seem that fast charging technology is already here. Best Buy is getting into motorcycles – think Geek Squad in mechanics' coveralls. This one's a little pricey, but even today it has dozens of hungry competitors, many at much lower prices. It makes you wonder: are conventional car manufacturers and dealers yesterday's news? 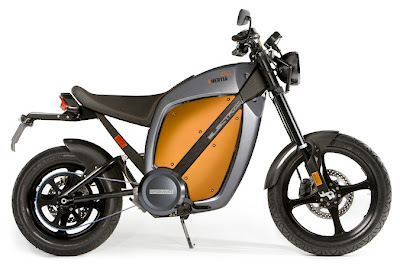 Why wouldn't electric manufacturers and retailers muscle in on scooters and other LEVs (Light EVs)? After all, they're just another electrical appliance. Just as we can expect electric companies to behave more like (or be taken over by) oil companies in the coming post-oil EV era, perhaps we should expect existing electronics/electric firms to play an increasing role in vehicle manufacturing and retailing. It's like I said a while back: electric scooters are going to be the next ipod. We'll be stamping them out by the millions, in 8 trendy colors. Interesting news today from Robert Rapier. Official EIA stats now show that 2008 set a new record for annual oil (crude + condensate) production. In early 2007, Deffeyes waffled once again -- this time backwards, to May 2005. As you would expect, this latest adjustment also turned out wrong. According to the very spreadsheet Ken references, the May 2005 level 74.241kbd was surpassed in July 2008, reaching 74.831kbd. Naturally, he had nothing to say about this on his website. For him, making predictions is like a bear shitting in the woods. Just kick some dirt over the last one when it starts reeking, and grunt out the next one. Of course, there's always the old standby: "We'll see who gets the last laugh, JD. Someday Ken's going to be right." Actually, I would dispute that. My current conjecture is that oil will never peak as long as Ken Deffeyes is making predictions. That's how truly rank his predictions are. 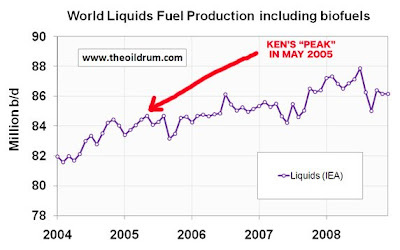 But whenever Ken finally shuts up and oil actually peaks, it's not going to be Ken who is proven right. We're all going to be proven right. Me, Mike Lynch, Daniel Yergin, CERA... literally everyone (aside from the mentally retarded) concedes that oil will peak. So on that glorious day when we're all proven right, I say we all go out for a rousing mutual backslap and group hug! A while back, Ken liked to talk about the "Cornucopian Cemetery", where cornucopians go when they admit that oil has already peaked. We have a similar feature here at Peak Oil Debunked. I call it the Peak Oil Prophet's cemetery. It's where you go after your 9th incompetent prediction of the peak oil date craps out. Hey Ken. Your ride is here.